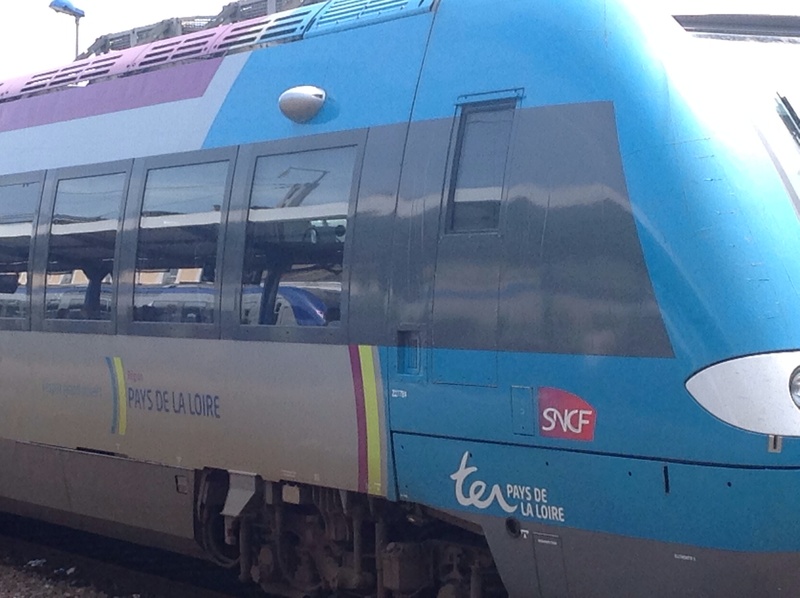 Train travel and luggage – thought threads written as we cross from Italy to France. And a second sitting as we make our final train journey from Quimper to Paris. The passing parade. Torino Italy to Nantes. Then Quimper to Paris. So timely at Rennes and caught up in the great French train strike. Our train to Paris is cancelled. Hopefully we can get on one a bit later with the rest of the crowd stuck at the station! The anxious morning start to catch the first train on the schedule for the day. Without this start our destination may not be reached. Every station is different. Some have electronic announcements but not in English. Others have the departure and arrival boards digitised. Others just have the yellow departure notices. Check our Train, find the platform and wait. Usually having to descend stairs and ascend onto platform, right arm very strong from carrying luggage up and down these stairs. Sometimes lucky to have a lift or escalator or even a side stair elevator to pop the luggage on. But usually the quickest is just to use the stairs. TIP travel lightly if travelling by train. I am taking less luggage each time. Scarves are great, shoes are a pain to select the right ones. My $10 Target jeans have been a hit. Nightly laundry in the shower keeps things in control and lessens the need for too much. Gutted as somewhere in Switzerland I have left my Icebreaker wool jumper. Has been such a great travel companion and I miss it. Maybe a good excuse to finally do some shopping in France. 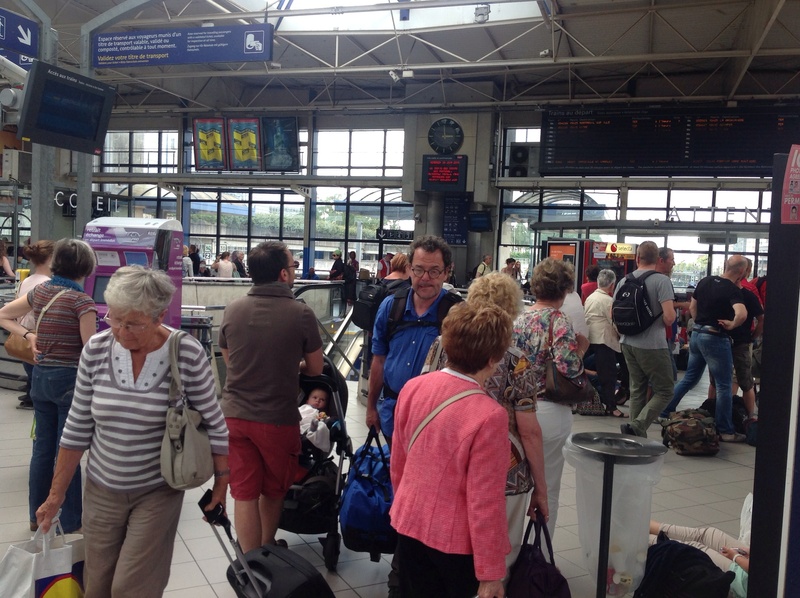 Back to trains – often narrow doors and steps to enter carriage – another reason for travelling light. Always a sigh of relief when the train rolls out. We’re on it. Then a matter off knowing our change stations, times, platforms to negotiate the next 2-7 trains for the day depending on our destination. Trains and Italy were an interesting mix. Plan was to travel from Lugano to Milan to Alba. Oops holiday and train to Milan was full plus there was a regional train strike. I had been warned of this frequent occurrence. Our day changed from one of train riding to a totally unplanned experience. First it was catch the Milan airport express bus – that at least would get us close to Milan. Alas no trains from airport to city. Even if we got to the city by bus there was every chance our next planned train to Alba was not going to be running. We’re at the airport and the queues are building at the car hire desks. Quick change of plans and we join the Avis/budget queue. No small cars left so off we trot in a lovely Citroen C5 from Milano airport. Thank goodness for GPS. For the next 3 days we happily explored Piedmontese from our farmhouse base in Alba. I think it was meant to happen that way. The hills were way too big and the roads too rough to enjoy cycling in the area. There were so many villages to explore in this beautiful wine region we were able to move around easily. Driver G became quite the European driver, only managing one small roundabout in the wrong direction and one one way street in the wrong direction. Not trusting Trano Italia any more we returned the car to Turin allowing plenty of time to leave the next morning still being unable to reserve a seat on the TGV to shoot us through to France. We were very relieved when the train rolled out of Turino, crossed the border into France and the French guard was very helpful. Some trains slice through the countryside smoothly, silently fast, others, sway, groan, squeal, grind their way along. Some plush and comfortable others hard and tired. See your reflection in the window as you ponder the passing landscape. Cars and cyclists waiting for us to pass at crossings. Shoppers shopping, children playing, washing flapping from balconies. The gentle sway of the train often lulls you into a little nap as the bright green countryside flashes by. Unknown towns, villages, cities not to be visited this time. Farmers going about their business in the fields, cutting, raking, baling hay. Construction workers and building sites. Cows calmly chewing their cud in the field of ample pastures. Canola pods filling, barley heads swaying in the breeze, poppy flowers showing their weed status in the crops. Few fences, just lines in the earth where a field has been tilled and another is nearing harvest. A patchwork of agricultural production to marvel at from any high viewpoint. Steep terraced vineyards and 3 rows squeezed between the train line and the cycle track. Forests of soft and bright greens. Rare to not see a house or barn or village in the field of view. Little waste of land here. The richness and fullness of crops is astounding. Vegetables and orchards, a food bowl in every direction. Over mountain passes, through tunnels, winding viaducts, following river valleys. Some valleys so tight there is a river, the train track and the road and no room for more. Trains don’t always enter a town or city by the prettiest root with the backs of buildings along the line and often the practice walls for street artists. But the upside is most stations are pretty central so when you arrive a well chosen hotel is usually a short walk or a tram ride away. Then free of the burden of luggage, exploration by foot is easy. Underground trains, buses, trams and trolley buses are always fun to use and you get to feel as if you know your way around when hopping on and off these during exploration of the new destination. Plan ahead, buy some snacks for the journey, grab a coffee when you can. Love the sound and movement of a train. It’s a comfortable and relaxing way to travel. Cutting through the countryside regardless of traffic congestion. No anxiety about driving or parking. Click clack rattity tat, click clack rattity tat, faster and faster, flashing by, top speed here we come, slowing again, squeal of metal, ding, ding over the crossings. Prochain arrete digital strip. People sleeping, reading, watching, old, young, locals, travellers, luggage, prams, bicycles, shopping, dogs. The “dooooing, dooong, doong” call to attention at French stations. Our train guard proudly telling us his cousin lives in Sydney and showing us photos of her surfing. Random thoughts written weeks apart! We love travelling Europe by train. We’ll do it again. This entry was posted in Europe, Musings, Travel and tagged Australia, Europe, France, photography, tips, trains, travel by jspsnaps. Bookmark the permalink.